“Interactive documentaries in public places” is one of the new territories that we want to explore this year at i-Docs. Whether it is through performances (see previous article about Choose Your Own Documentary), interactive installations (see Arte’s recent Type:Rider) or public exhibitions… i-docs are clearly getting out of the screen! Convictions, an exhibition by US artist and academic Sharon Daniel at STUK (Leuven, Belgium), is a clear example of how i-docs can have a life in a public space and be more than a one to one solitary experience. You have till the 17th of November to engage with four of Sharon Daniel’s projects: Public Secrets, Blood Sugar, Undoing Time and Inside The Distance. Each of these projects expresses Sharon Daniel’s commitment to question theories of justice and punishment through the voices of those who are trapped in the criminal justice system. Each peice is very strong on its own, but put together in a single space, these voices become a corpus of evidence, a collaborative story… and maybe a cry for change. As I wanted to know more about Sharon’s exhibition in Leuven I asked her a few questions…. SG: Your exhibition Convictions has opened on the 26th of September at STUK, Leuven, and will be on till the 17th of November. Why are all of the projects you are presenting focusing on the topic of criminal justice? SD: Each of the four projects in the exhibition (Public Secrets, Blood Sugar, Inside the Distance and Undoing Time) is part of a series of new media documentaries that examine various aspects of criminal justice system through first hand testimony and evidence given by impacted individuals. Since I began work on Blood Sugar over 10 years ago, by volunteering at a needle exchange and engaging with homeless injections drug users, I have been looking at justice and punishment, the criminalization of poverty and difference, and the phenomenon of mass incarceration in the US. I visited Belgium in 2011 when Public Secrets was part of the Artifact Festival at STUK Kunstcentrum. STUK curator Pieter-Paul Mortier introduced me to a group of researchers and professors at KULeuven’s Institute of Criminology who work on restorative justice. I became interested in restorative justice as an alternative to retributive justice and we agreed to pursue a collaborative research project exploring the potential of art practice in relation to social justice with the goal of producing a new media art work documenting victim/offender mediation in Belgium. STUK partnered in the project, which was funded by OPAK, and Pieter-Paul Mortier decided that we should premiere the result of our collaboration in the context of an exhibition of my other works on criminal justice at STUK. SG: Why using digital media to talk about prisons and justice? 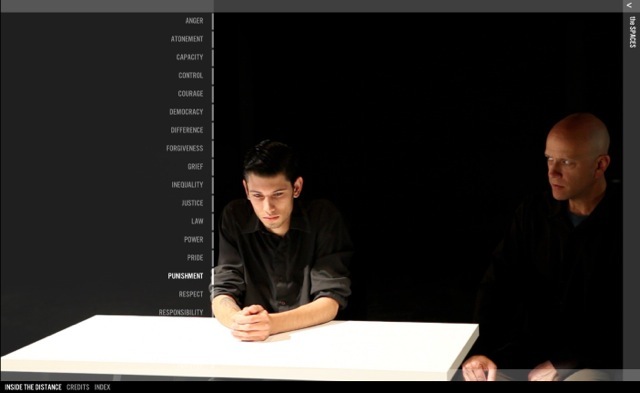 What can an interactive interface add to a linear narrative when it comes to this type of social/political topics? SD: Using digital media and creating an interactive interface that allows the audience to navigate a large number to interviews/stories as opposed to telling just one story in linear form allows me to take the focus off individual responsibility and help the viewer to understand and recognize that the stories, together, represent the experience of a subjugated or oppressed “class” – as opposed to seeing the “exemplary” story as a tragic, but isolated, narrative. It takes more than one story. My goal is to allow the participants to speak from their primary experience, (as an individual with a particular perspective) and as part of a “class” of shared experience. I believe that speech of this kind, carried into the register of representation, has transformative power – both for the speaker and the listener. Through interviews and other forms of research I document an issue as a larger “site” of socio-political and economic experience – rather than through a single, exemplary story or individual narrative. In my process I work to collect a significant amount of direct testimony from a given “site” and then I design an interface structured in a manner that will circumscribe that “site” as articulated by the people I have interviewed and read. Rather than building a single road across that site to get from point A to point B (or the beginning of an argument to its resolution), the database design of any given project maps out an extensive territory – say, 100 square miles — and the interface sets the viewer down within the boundaries of this territory — allowing her to find her own way – to navigate a difficult terrain, to become immersed in it, and, hopefully, to have a transformative experience. SG: What is the specificity of each of the four projects that you are presenting? Do they each explore a different facet of the same topic? 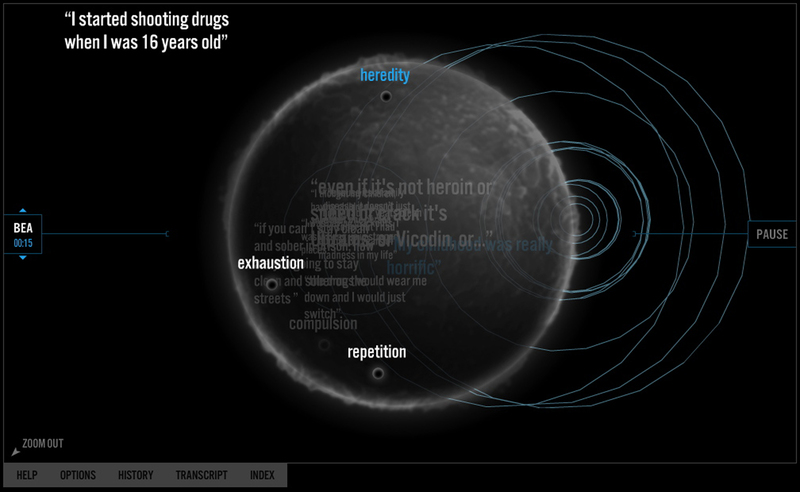 DS: Public Secrets and Blood Sugar each provide interactive interfaces to audio archive of hundreds of statements made by incarcerated women and injection drug users. Public Secrets links the individual testimony of 25 incarcerated women social theory and legal evidence, in an effort to engage the public in a critical dialogue about crime and punishment and challenge the assumption that imprisonment provides a solution to social problems. While Public Secrets addresses the topic of mass incarceration with a focus on the escalating incarceration of women, Blood Sugar examines the social and political construction of poverty, alienation, and addiction in American society through the eyes of those who live it. Because addicts in the US must fear encounters with regimes of enforcement they are afraid to be seen — but they do want to be heard. Theirs are the most important voices in the discourse around addiction, public health, poverty and belonging in America. Visitors navigate a multi-vocal narrative that links individual testimony and public evidence, social theory and biological research. In Undoing Time the statements of men and women in prisons across California – whose voices are often unheard in debates on criminal justice, its policies, legislation and governance – are inscribed into material objects produced in prison factories. In videos that accompany these objects their experiences are demonstrated through speech and gesture. For example, a video portrait/interview of former prisoner Beverly Henry (who worked in a California prison flag factory while incarcerated) is installed with two American flags produced in the flag factory where Beverly worked. The text of an op-ed piece Beverly wrote on the 254th anniversary of Betsy Ross’s birth is embroidered into the stripes of the flags. In the video Beverly performs a symbolic act – undoing the stiches of one of the flags made in the prison factory – while she describes the search for democracy from a socio-economically marginalized position that many in our state and nation share. In the op-ed text and in her recorded statements Beverly’s reflections on the promise of life, liberty and the pursuit of happiness that our flag represents, challenge us to examine the structural inequalities at the root of our extraordinary expansion of penal confinement. 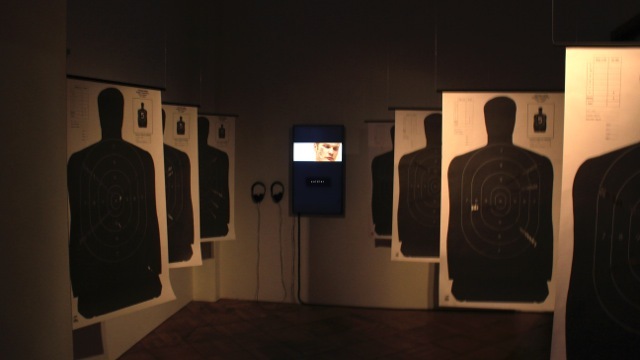 In another part of the installation human shooting targets produced in a prison print shop are paired with a video portrait/interview of “Franky” – a 21-year-old man who, as a member of California’s notorious Norteño gang (both in and out of prison) has been trapped in a cycle of violence and punishment since he was 12 years old. 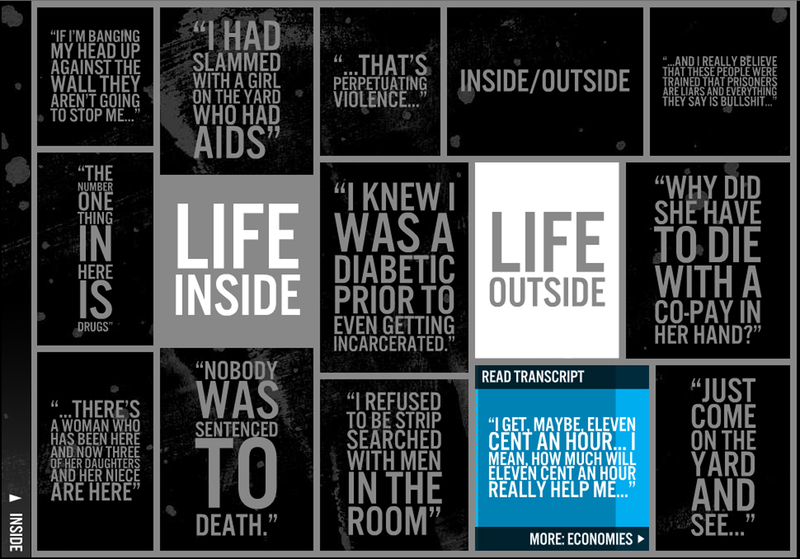 The targets are perforated with cut-out quotes that describe Franky’s experience as both a gang soldier and target of state and gang violence inside the maximum security facilities he has inhabited. Finally, the project Inside the Distance, documents victim/offender mediation practices in Belgium and how mediation poses a potential cultural alternative to dominant modes, methods and theories of justice and punishment. This work, which includes interviews I’ve conducted with Mediators, Criminologists, Victims and Offenders in Leuven and Brussels, focuses on the subject positions of victim, offender and mediator and the notion that those subject positions are fluid. The tag-line for the project is “we are all victims | we are all offenders”. Criminal acts are rents in the fabric of the social order – expressions of something that doesn’t fit. The mediators I interviewed tell how mediations almost always begin with a focus on the details – victims and offenders wanting confirm each others’ understanding of what happened – who was hurt and how – then finding some way to understand why – acknowledging the instability of the positions they are in. Within Inside the Distance the space of mediation – the mediation table – is represented as a boundary object – a place of cooperation without consensus. The idea of mediation as a kind of boundary object for my own research also helps me to grapple with questions of ethics. I have viewed my work as a form of resistance, critique, opposition and advocacy. But I have long held in somewhat uncomfortable tension my position as a prison abolitionist with my sense of practical ethics – the question of how resistance in a pure, theoretical and political framework can improve the material realities of those who are oppressed by our criminal justices system now. Thinking of mediation as a boundary object helps me hold these competing desires – not in balance but in tandem – allowing me not to have to choose one or another but to act ethically in relation to both. My hope is that this work can also function as a mediation – a boundary object for viewers – across conflicting and unequal relations of power and unstable subject positions. SG: Your projects where designed for the web. Is it a challenge to exhibit them in a gallery? How have you organised the space? SD: Most of my work over the past 15 years has been disseminated online but each project has also been exhibited in one form or another in festivals and in gallery spaces – usually as a single screen projection with either a mouse, or, in the case of Blood Sugar, a Wii controller. One of my earlier participatory media projects, Palabras Tranquilas (2005-2007), was exhibited in this manner but also used as part of a dance theatre production and series of workshops by my project collaborators – the arts NGO Crear de la Pena in Argentina and Germany. Subtract the Sky was presented as a kind of interactive work-space within an installation by Altelier Van Lieshout at the Dutch Electronic Arts Festival in 2003 and a 6-part installation of Narrative Contingencies (1996-2001) was part of the Corcoran Biennial in 2001. These three works were all originally designed as online interfaces. For this exhibition curator Pieter-Paul Mortier wanted to take on the challenge of presenting the online interfaces in a new and compelling manner – for example, we broke out the main elements of Public Secrets (the introduction, conclusion and body or database) into three separate displays that the visitor encounters progressively walking through the space. The introduction is projected with amplified sound on a very large wall facing the door of the gallery space. 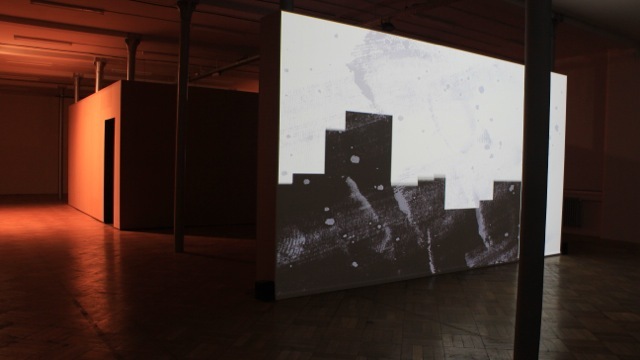 The body of the work is accessed through a large touch screen with head phones embedded in a table set behind this wall and the conclusion is shown on a flat screen with headphones mounted on the front wall of a soundproof box built halfway into the space. The sound proof box creates a separate space for Blood Sugar nested within the large gallery. Inside the Distance is installed in the space between the back wall of the box and the back wall of the main gallery space. 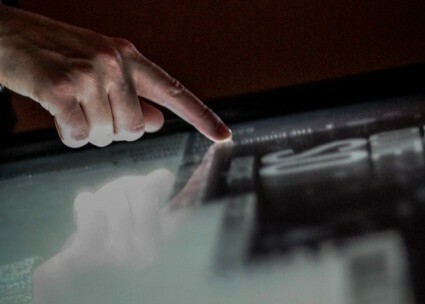 A flat screen is mounted on the back wall of the box showing the introduction to the piece and the interactive interface to the body of the work is displayed on a touch screen mounted into a custom-built table that echoes the image of the mediation table that is used throughout the piece. 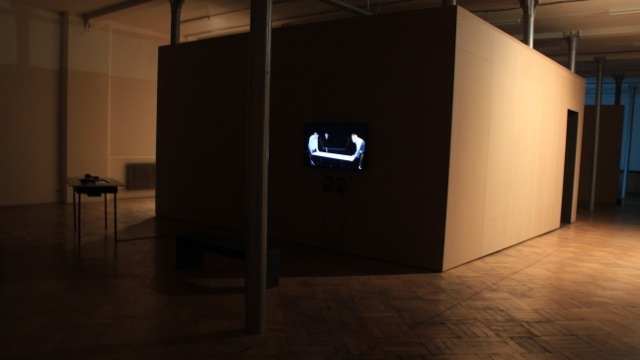 There are two smaller gallery spaces beyond this that contain the two video installations that are part of Undoing Time. This organization of the space allows visitors to move through the works – in more-or-less chronological order – like a sort of spatial and interactive, yet cinematic experience. SG: What else are you working on at the moment? Can you tell us a little about your future plans? SD: I just completed Inside the Distance for the opening of the exhibition at STUK. The web version will launch in about a month and I’m collaborating with my partners at the Leuven Institute of Criminology at UKLeuven on a publication related to the exhibition. I intend to continue to explore restorative justice research in other contexts. I’m also working, as a partner of Relocate Kivalina [relocate-ak.org], on a project documenting conditions in an Alaskan Native Village above the Arctic Circle. And while I am still developing additional installation pieces for Undoing Time I continue to investigate and document the injustices of the criminal justice system in California where, at the moment, I’m focusing on the abusive practices of solitary confinement. Convictions, at STUK, Leuven (Belgium) till the 17th of November.